Bouye (toe) had 54 tackles (46 solo) and one interception in 13 games this season. Analysis: Bouye missed the season finale with the toe issue and was sidelined for a few weeks earlier in the year with a calf injury. The 27-year-old had only eight passes defensed in 2018 after recording at least 16 in each of the previous two seasons. 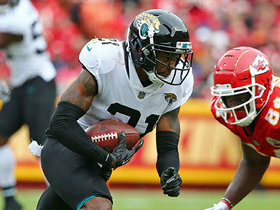 Bouye will carry a $15.5 million cap hit in 2019, but he seems likely to return to Jacksonville despite the small dip in production this year. Bouye (toe) was ruled out for Sunday's season finale against the Texans, Daniel Popper of The Athletic reports. Analysis: Bouye was unable to practice this week due to the toe issue, so this hardly comes as a surprise. Tyler Patmon and D.J. Hayden (groin) -- who is listed as questionable -- should see increased workloads opposite starting cornerback Jalen Ramsey. Bouye (toe) did not participate in Wednesday's practice. Analysis: Bouye picked up an undisclosed injury to his toe during last Sunday's game against the Dolphins. While there doesn't seem to be any concern for his availability for this weekend's regular-season finale, that could change if Bouye remains sidelined Thursday and Friday. Bouye is probable to return to Sunday's game against the Dolphins due to a toe injury. Analysis: Bouye exited Sunday's contest during the second half. The starting cornerback is expected to retake the field, but as long as Bouye remains sidelined Quenton Meeks will benefit from a notable uptick in defensive snaps. Bouye (calf) was a full participant in Thursday's practice. Analysis: Bouye was limited to begin the week, but he now appears to have fully recovered from a lingering calf injury. Barring any setbacks, expect the starting cornerback to suit up for the first time since Week 7 during Sunday's tilt against the Steelers. Bouye (calf) was a limited participant in Wednesday's practice, Teresa Varley of the Steelers' official site reports. Analysis: Bouye continues to progress in his recovery from a lingering calf injury, which has kept him sidelined since Week 7. If the starting cornerback is unable to return to full health and suit up against the Steelers on Sunday, expect Tyler Patmon and D.J. Hayden to each see an uptick in defensive snaps. Bouye (calf) was ruled out for Sunday's game against the Colts, Michael DiRocco of ESPN.com reports. Analysis: Bouye ruled himself out earlier this week -- unbeknownst to coach Doug Marrone -- and has now officially been ruled out. Tyler Patmon and D.J. Hayden should both see increased snap counts against Andrew Luck and the Colts. Bouye (calf) indicated Wednesday he wasn't going to play Sunday against the Colts, Phillip Heilman of The Florida Times-Union reports. Analysis: Bouye apparently neglected to provide the news to his coach, as Doug Marrone said, "I guess I'll have to talk to him about that. That's not what the trainer told me." The 27-year-old did not practice Wednesday as he continues to nurse the calf injury that forced him to sit out the Week 8 loss against the Eagles. Bouye's injury situation should receive some additional clarity as the practice week unfolds. Bouye (calf) did not practice Wednesday. 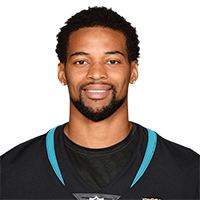 Analysis: Bouye does not appear to have fully recovered from his calf injury during Jacksonville's bye week and should be considered questionable for Sunday's game against the Colts. If Bouye is unable to return to practice this week, Tyler Patmon could serve as the Jaguars' top right cornerback Week 10. Tennessee Titans running back Derrick Henry runs 15 yards on wildcat play. 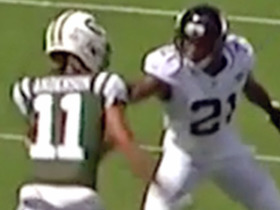 NFL Network's Andrea Kremer takes an in-depth look at the relationship between Jacksonville Jaguars cornerback A.J. 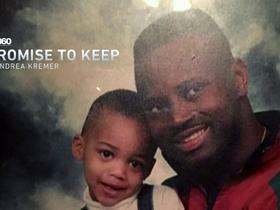 Bouye and his father. 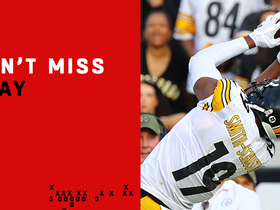 Pittsburgh Steelers quarterback Ben Roethlisberger finds wide receiver JuJu Smith-Schuster for a 35-yard gain. 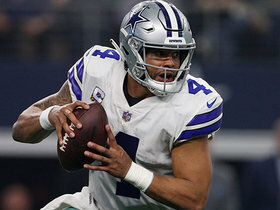 Dallas Cowboys quarterback Dak Prescott rushes for a 28-yard gain after spinning around the backfield against the Jacksonville Jaguars. 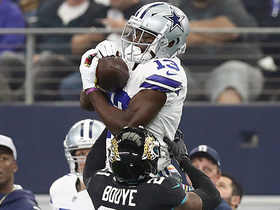 Dallas Cowboys rookie wide receiver Michael Gallup holds on tight to the ball for a 27-yard gain against the Jacksonville Jaguars for Week 6. 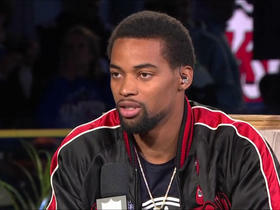 Jacksonville Jaguars cornerback A.J. 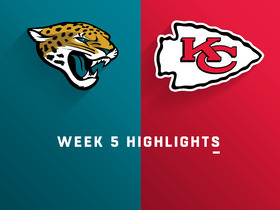 Bouye reads the quarterback and intercepts the pass thrown by Kansas City Chiefs quarterback Patrick Mahomes. Jacksonville Jaguars corner back A.J. Bouye penalty calls back New York Jets quarterback Sam Darnold pick.